With some of the leftover dough from my mini blueberry tartelettes, I decided to make blackberry tarts as well. I love the versatility that comes with making dough. The dough recipe I use is super simple to put together and I find that only slightly tedious part is to roll out the dough to your desired consistency and shape. To tell you the truth, I have a myriad of kitchen gadgets in the house but still haven't gotten around to purchasing a rolling-pin. It's more out of sheer laziness than anything else - when I go to my favorite kitchen stores I usually have a dozen things I want to buy and by the time I remember to get the rolling pin, I'm already out of the store and don't go back in. So, I've been using an empty wine bottle to roll out dough. While it does the trick, I'm thinking that next time I'm headed for the store I'm grabbing that rolling-pin before anything else catches my eye. I guess the moral of the story is that sometimes, even without the right tools to do the job, the end result can be pretty good! This recipe is the same one as the blueberry tartelettes recipe, but I omitted the glaze and baked the tarts for a few minutes longer because of their larger size. The end results can be MORE than good, by the looks of those tarts - perfection!! 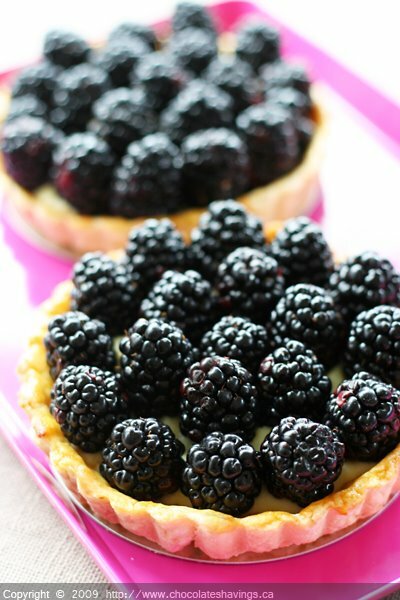 Your tarts are just beautiful. I can only imagine home good they taste. I can't decide between the two....So, how 'bout both, plus raspberry and strawberry? What a beautiful blog you have. I'm looking forward to trying your recipes. And thank you so much for your visit. I hope you will come back again soon. Your tarts look perfect, just like something I would buy in cute little bakery. Well done! Beautiful looking tarts and I am sure they were just as tasty. Your tarts look fantastic! The wine bottle is clearly working very well for you. Those tarts look so good! Those tarts are simply gorgeous!!! What beautiful tarts. I love blackberries and this is making me long for blackberry season! Beautiful Job. I would pay good money for something so pretty and delicious! Tarts are unknown territory for me but they are so gorgeous I may start to experiment soon! I totally agree with that story moral. Those tartellets look seriously good! Nothing wrong with using a winebottle... I've done it for year although I'm quite pleased to say that I now have not one but two rolling pins! They do make life a tiny bit easier. look absolutely perfect. blackberries are so tasty! Oh wow! These looks fabulous! I love blackberries! Can't wait to get my hands on the first blackberries of the season. Your lighting in the photo is amazing! Now that is a nice way to enjoy some blackberries! The tarts look great!